The first step to installing a carpet is choosing the right one, today it is important to have a price range first because it is not always about the size of the carpet. 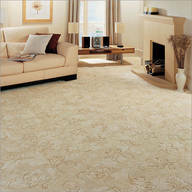 Different textures of carpets are available and having a budget will help a supplier narrow down your options. Before you start doing anything it is important to clean your floor so that there is no dust there that can disturb the installation of the carpet, This can be done with a broom or preferably a vaccum. If possible remove the doors from your room so that you do not have to work around them, this will make your job much easier and faster. Laying down a carpet pad is next in the process this will make your floor much more comfortable to walk on and to insulate the room. If you have any excess pads against the wall use a box cutter to cut it so that the tacks. Then take the actual carpet outside and lay it down, unroll untill you fiind the two notch points. Draw a chalk line between the notches on each side and cut the carpet there. After this take the carpet inside and lay it down in the area you want it. Use the recommended glue that the company offers to bind the two side together again and to strethc the carpet out. When the carpet are in the corner cut any excess and when they are sitting flush to the corner put heavy objects in the corners and let the carpet sit until it has relaxed.